“All of us do not need Calculus, but we need fundamental math. We need to integrate math with each trade area, so it becomes valuable. You think you’re dong separate courses, but you need to apply it; connect what is happening in the trade area with what you are doing in math,” said Ms. O’Brien. BTVI has therefore decided to face the challenges head on with the introduction of ALEKS, a web-based, artificially intelligent assessment and learning system. The system allows instructors to create lessons based on their course outlines. On the students’ initial log in, they are given a knowledge test to assess what topics they have mastered and what topics they need to work on. Based on those results, ALEKS creates a personal learning plan that teaches and assesses students’ mastery of content and skills. The system also regularly tests and retests the same skills to ensure students retain knowledge. 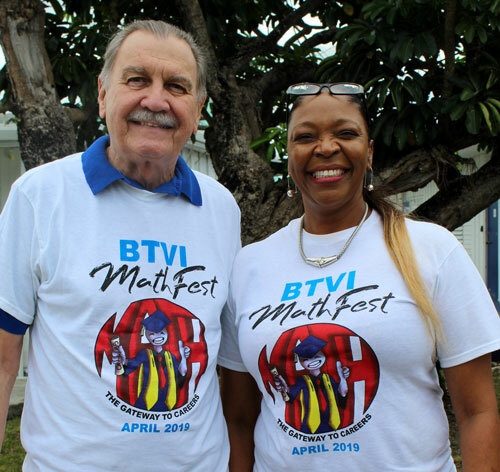 During the opening ceremony of the Bahamas Technical and Vocational Institute’s (BTVI) Math Fest, Math instructor, Ron Clarke and Chair, Archilene O’Brien, proudly wear t-shirts designed by student, Dasha Turnquest. In spring 2018, BTVI students’ College Algebra pass rate improved by 12.6% and students dropping Math classes was at an all-time low of 6%. Ms. O’Brien will be presenting a paper on the success of ALEKS at BTVI during the fourth international conference on technical vocational education and training (TVET), slated for May 22nd – 24th in Jamaica. She noted that access to opportunities might not become a reality without at least grasping basic Math. “Although you want to study Psychology, Arts or the Humanities, you need the fundamentals of Math. We are in a global village. Your competition is not the person living off East Street or who went to high school with you. 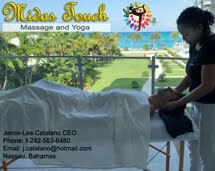 Your competition is global, so when we stress you with ALEKS it is because we care,” she said to the students in attendance. According to Ms. O’Brien, the Math performance of each student working on the program improves. There is reportedly less classroom frustration as students become independent learners. “The extent of your improvement is directly related to how much time you spend on it,” said Ms. O’Brien. Additionally, BTVI’s President, Dr. Robert W. Robertson noted that Math is a phobia for many people, therefore the math awareness week was a step in the right direction and particularly the introduction of ALEKS. “Ms. O’Brien being able to present a paper at an international TVET conference is based on the good results we’re getting here at BTVI. Math is a fundamental skill for all trades, whether Cosmetology or Electronics. All of the jobs of the future, you would need basic Math skills. 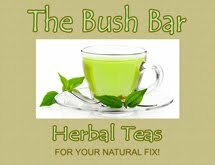 The more you know, the better off you’d be,” said Dr. Robertson. 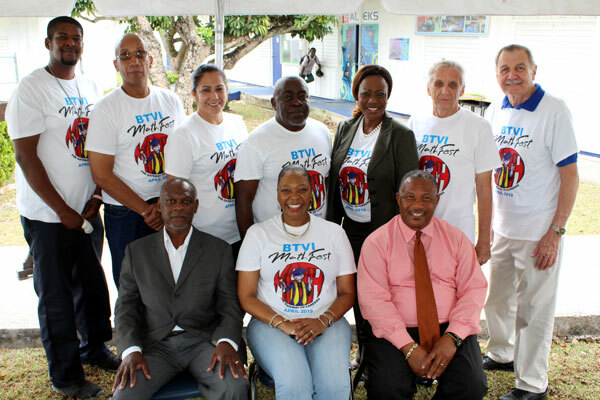 BTVI Board Chairman, Kevin Basden, added that the math awareness week was a great initiative. “Math has a special place in my heart. It has been my favourite subject from pre-school to college. 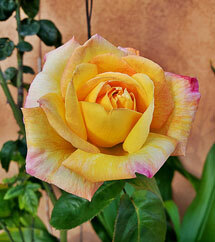 It is not difficult; it’s just a matter of understanding the concepts. TVET includes measurement and angles; math is here in everyday life,” said Mr. Basden. Mr. Basden noted that there needs to be a paradigm shift in people’s thinking about math, particularly as it is used in everyday life. BTVI instructor, Ron Clarke, in an earlier interview credited ALEKS for changing his students’ attitudes towards Math and making it easier for him to focus on those who need special attention. “I have been teaching Math at BTVI for the past eight years and ALEKS is the best program that has ever happened to us,” said Mr. Clarke. “In ALEKS, I can see every mistake the students make and how many times they’ve made it, so I can then go and give individual attention to students with problems. So everybody moves at their own pace. Students love technology. They can get on to ALEKS from their smartphones or tablets and sit around campus and just practice Math. They love it,” he said.